Keith Moore is Europe’s biggest cocaine dealer. The police have been trying to nail him for more than twenty years. Now four CHERUB agents are joining the hunt. But can James and his friends enter the lion’s den and infiltrate Keith Moore’s evil hideout, when dozens of attempts by undercover police officers have failed? The CHERUB kids had better succeed. Because if they fail, they’re dead. Love bestselling spy series CHERUB? Our top tips for more action thrillers you won’t be able to put down. I loved the book, it’s got amazing jokes and action. Another incredible book. Funny, exciting, tension. This book is INCREDIBLE! 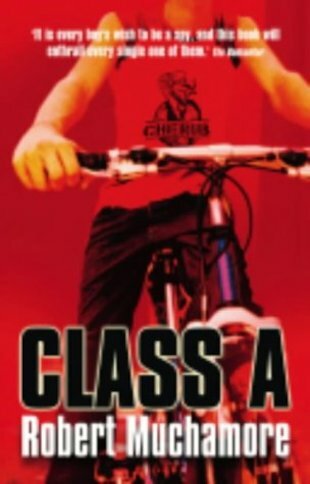 Class A is different and ten times better then any other books like Alex Rider, it’s more realistic and you find yourself constantly reading it. The second book in the series takes James on his biggest adventure yet! This one is exciting, thrilling, with a hint of humor! It is the best CHERUB book in my opinion! Robert Muchamore is the author of hit spy series CHERUB and Henderson’s Boys. Robert Muchamore has won several awards for the best-selling Cherub series, including the Red House and Salford awards for The Recruit and the Portsmouth Book award for Maximum Security.